I don't know about you, but I enjoy being able to simplify things. Take the book, "Atlas Shrugged." It's about 900 jillion pages long. And I read it this summer. And at the end, it could be summed up into one single sentence -- Society was breaking so these 3 guys convinced all the smartest and hardest working people to leave so it would implode. There. I've saved you endless hours of reading and actual thinking. 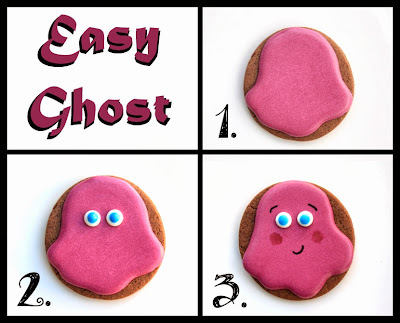 Sometimes... cookies need to find the simple version of themselves. Especially for holidays. 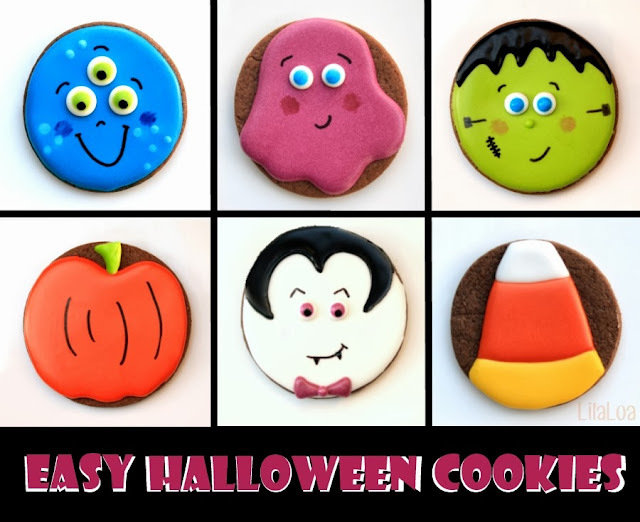 Especially for holidays that call to the novice cookie decorator like an alarm clock mis-set for 3 am that is also hiding under the couch and you can't find it until you are completely awake. 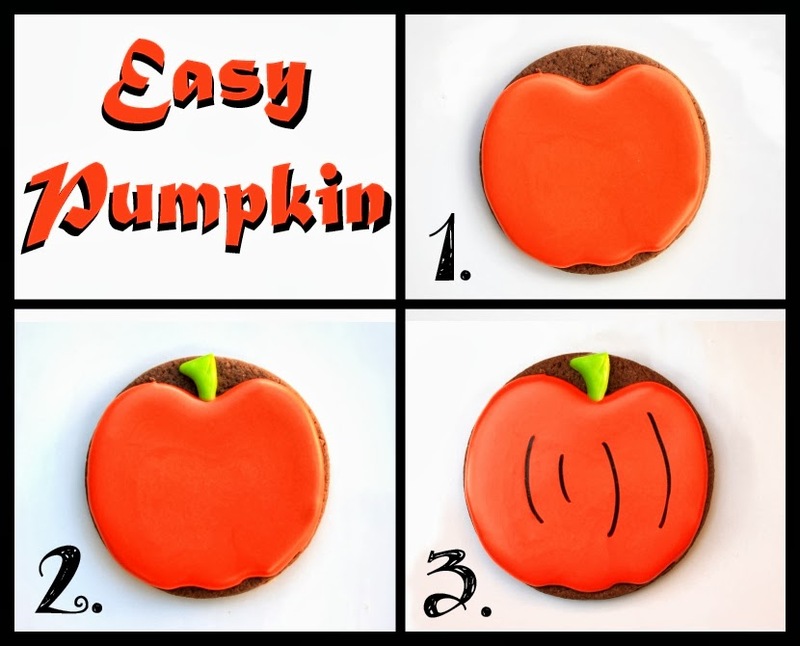 Sometimes, you just can't shrug off that desire to decorate a cookie. Even if you don't have cutters... you can still make these gems. Just use a drinking glass to cut out a bunch of round circles. And make some eyeballs before you get started. It's Halloween season. You can put eyeballs on pretty much everything. I know, because I've tried. 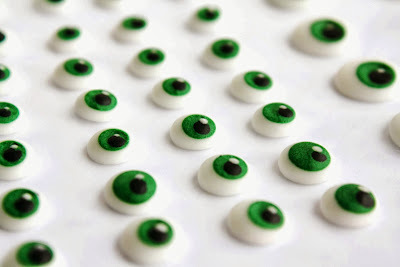 Click HERE for a tutorial on making eyeballs. 1. The key to most of these cookies is just letting each step dry for 20-30 minutes. Start by piping some yellow 15 second icing on the bottom of the cookie. Let it dry. 2. Add some orange icing and let it dry. 3. 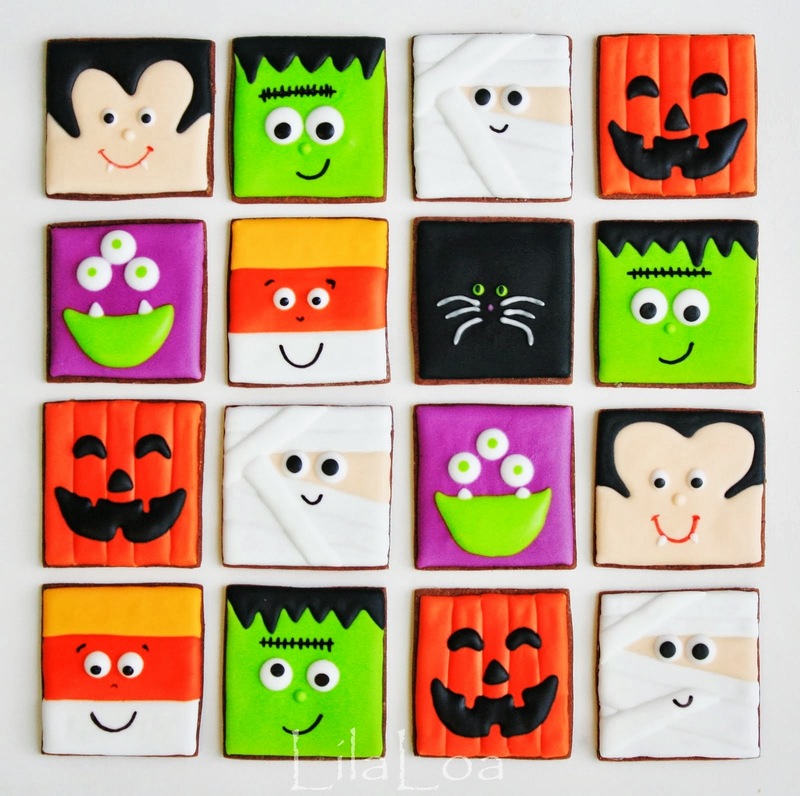 Finish up with some white icing and let it dry overnight before stacking or wrapping. 1. Ice the entire cookie in electric green icing. (In a hurry? 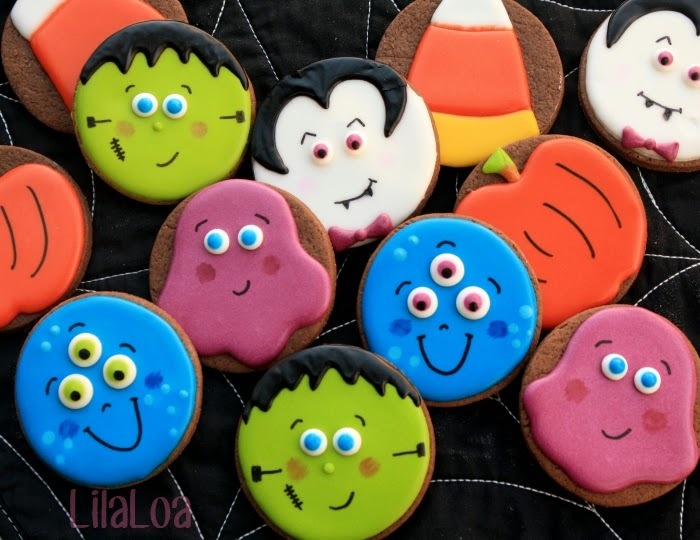 Check out how Created by Diane ices cookies HERE.) Allow to dry for an hour. 2. Pipe on some jet-black spiky hair. 3. Pipe a tiny dot of green onto each eyeball and press gently to the face to secure. Add another tiny dot for a nose. 4. Make sure the face has been given at least TWO HOURS to dry before you attempt this step. Use a black food color marker to give him eyebrows, bolts, a happy little smile, and some stitches. I used a paintbrush and some pink food coloring to give him some cheeks, but you could also use luster dust. 1. 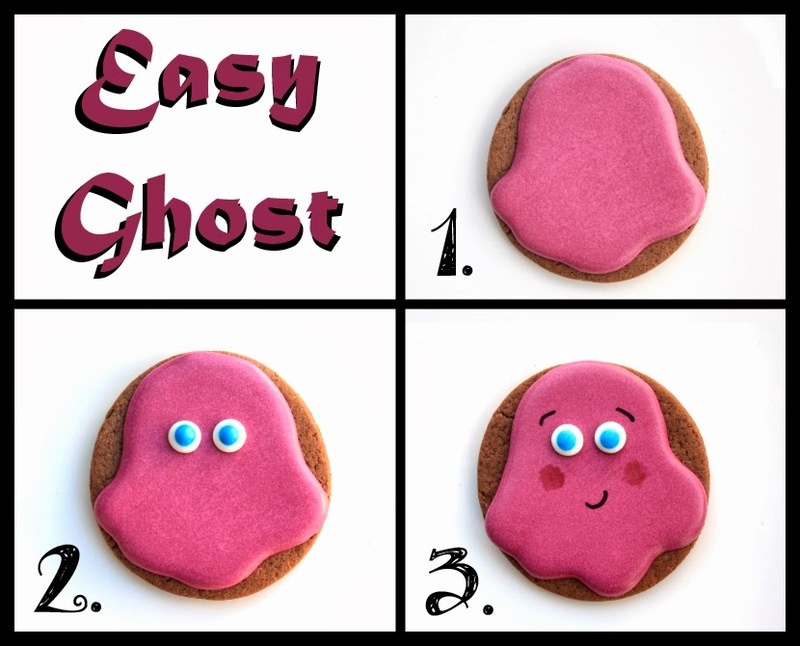 I have never been more in love with a little ghost cookie in my entire life. I want to find a way to continue making him for Thanksgiving and Valentine's Day. Just blob out some purple icing in a general blobby shape. You could also use white if you are a Halloween Ghost purist. I don't mind. Let it dry for a couple of hours. 2. 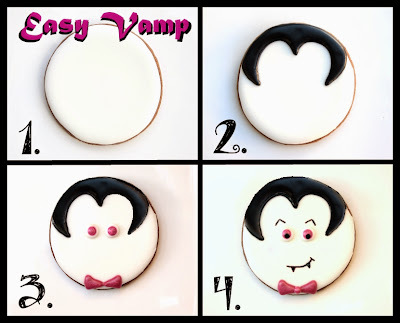 Use a tiny dot of icing on the back of the eyeballs to secure them to the face. 3. Use a black food color marker to give him a smile and some eyebrows. I used pink food coloring and a paintbrush for the cheeks. 1. 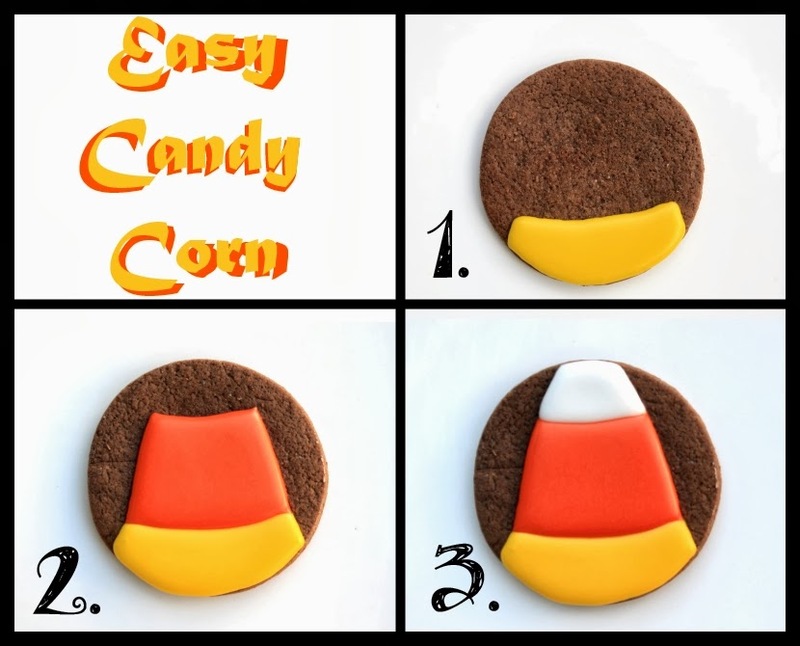 Umm, this cookie really couldn't be easier. Pipe a vague pumpkin shape with orange icing and let it dry for a couple of hours. 2. 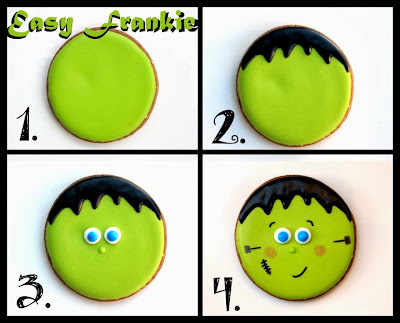 Using electric green icing, give it a bit of a stem. 3. Use that black food color marker to make some pumpkin sectional lines. 4. That's it actually. No more steps. 1. I don't know why I make vampire cookies. I never like them. But you can like them if you want. I won't judge. Flood the cookies with white icing and let it dry for an hour or so. 2. Give him some oddly shaped vampire hair with black icing. Let that dry for a while too. 3. Attach the eyeballs with tiny dots of icing and pipe two triangles for a bowtie. Let dry for 20 minutes. 4. Use a black food color marker to give him some questioning eyebrows and a fanged smile. Add a tiny dot of purple to finish the bowtie. 1. 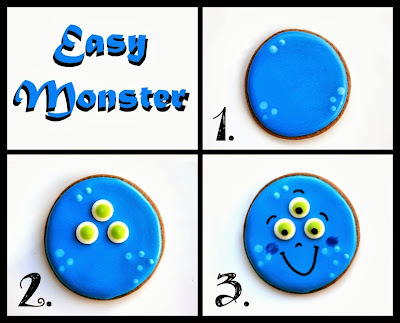 Ice the entire cookie with blue icing. Immediately add some random drops of a lighter blue icing. Let it dry for a couple of hours. 2. Attach some eyeballs with tiny dots of icing. 3. Give him some happy eyebrows. And also, if your eyeballs just look weird like mine, you could add some black pupils to make everything okay again. And a cute little nose. And a happy smile. And, if you really wanted to, you could use a paintbrush and some pink food coloring to give him some adorable little cheeks too. 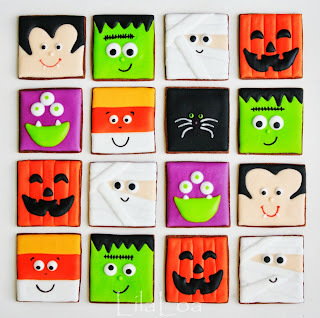 If circles aren't your thing... you could also try the Square Halloween Cookies HERE.